As we mentioned last time, new countertops are a great way to refresh your kitchen and add to value of your home. Plus, they are normally a critical part of any kitchen remodel or renovation project. In our prior post, we discussed the more common countertops, including Granite, Marble, and Laminate. This time, let’s take a look at the newer and/or more unusual countertops that are on the market. Solid Surface countertops are seamless, durable, and nonporous. Importantly, a scratch can easily be buffed out due to its accommodating composition. But as these countertops are susceptible to heat, a cutting board is a must. Soapstone countertops are relatively durable, stain- and bacteria-resistant, and definitely unique in appearance. In fact, no two Soapstone countertops will ever be the same. While durable, soapstone is softer than most other surfaces and prone to scratching, pitting, and other damage. Some maintenance may also be required if you desire surface consistency as the countertop ages. Concrete countertops can offer nearly unlimited design options relative to color, shape, and edge profiles. Likewise, a concrete countertop is highly durable and stain-resistant when sealed. However, the sealer can also hinder heat resistance, a tradeoff the homeowner will need to consider. Bamboo countertops are not just for the tropical get-a-ways! With pricing comparable to other hardwood options, Bamboo can be an excellent renewable, environmentally-friendly choice. However, it is susceptible to heat and, despite its strength, can be nicked and dented. 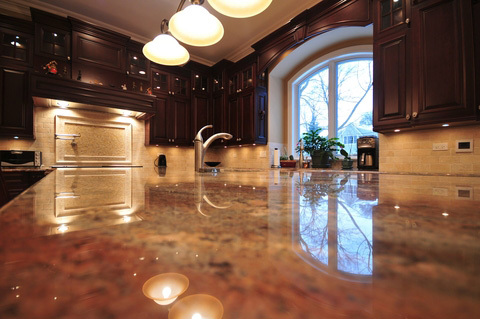 Copper countertops are truly beautiful and can quickly add character to your kitchen. They are easy to clean, and by nature, are anti-bacterial. Depending on your tastes, though, a change in color when in contact with various substances can be a plus – or a negative. Copper can also scratch and dent easily, resulting in even more “character” over time. Pewter countertops are easily stamped and formed. As a result, Pewter can accommodate nearly any shape and used for decorative, unique edges. Original Pewter contained lead and was not recommended for surfaces that would contact food. Today’s Pewter, however, is typically lead-free and can be used for countertops, backsplashes, and more. Soft by nature, Pewter can be scratched and dented. Zinc countertops are unique as they are beautiful. Plus, they are resistant to bacteria, mold, and mildew. Like other metal countertops, Zinc can scratch and dent and are susceptible to marks from hot pans. IceStone® (or Bio-Glass) countertops are made from recycled glass and cement. If looking for an eco-friendly countertop, this may be your solution! They are durable, relatively nonporous, and heat-resistant. However, they are prone to cuts and scratches and require regular sealing. Paper Composite (such as PaperStone®) countertops are a composite material made from post-consumer recycled paper. These countertops are durable, relatively heat- & stain-resistant, and easy to clean. They do, however, require sealing and shouldn’t be cleaned with abrasive materials. Some scratching can occur, as can staining on lighter colors. That rounds out our discussion on the many countertops that we’ve seen used in kitchen and bathroom remodeling & renovation projects as well as new construction. If you have questions or need more information, just give us a call! Check back again! We’ll continue to add helpful information for your remodeling, renovation, and new home projects. Hosting a holiday meal? Plan ahead to maximize your kitchen's potential! Time for a Kitchen Remodel? Choose Easy-to-Clean Materials. Massillon Navarre Canton Ohio Web Design & Development by One Meeting Street.